Later that year, in December 1967, Rev. Dr. King announced the plan to bring together poor people from across the country for a new march on Washington. This march was to demand better jobs, better homes, better education—better lives than the ones they were living. Rev. Dr. Ralph Abernathy explained that the intention of the Poor People’s Campaign of 1968 was to “dramatize the plight of America’s poor of all races and make very clear that they are sick and tired of waiting for a better life.” Rev. Dr. King proposed, “… If you are, let’s say, from rural Mississippi, and have never had medical attention, and your children are undernourished and unhealthy, you can take those little children into the Washington hospitals and stay with them there until the medical workers cope with their needs, and in showing it your children you will have shown this country a sight that will make it stop in its busy tracks and think hard about what it has done.” King aligned with the struggle of the poor and black sanitation workers in Memphis, Tennessee in March and April 1968. He suggested their struggle for dignity was a dramatization of the issues taken up by the Poor People’s Campaign—a fight by capable, hard workers against dehumanization, discrimination and poverty wages in the richest country in the world. As a first step in building the power needed to achieve the goal of a radical redistribution of political and economic power King, along with other leaders of the poor such as Johnnie Tillmon of the National Welfare Rights Organization (NWRO), helped work out the major elements of the platform for the Poor People’s Campaign of 1968. An important aspect of the Campaign was to petition the government to pass an Economic Bill of Rights as a step to lift the load of poverty. The Campaign was organized into three phases. The first was to construct a shantytown, to become known as Resurrection City, on the National Mall between the Lincoln Memorial and the Washington Monument. With permits from the National Park Service, Resurrection City was to house anywhere from 1,500 to 3,000 Campaign participants. Additional participants would be housed in other group and family residences around the metropolitan area. The next phase was to begin public demonstrations, mass nonviolent civil disobedience, and mass arrests to protest the plight of poverty in this country. The third and final phase of the Campaign was to launch a nationwide boycott of major industries and shopping areas to prompt business leaders to pressure Congress into meeting the demands of the Campaign. The efforts of the Poor People’s Campaign climaxed in the Solidarity Day Rally for Jobs, Peace, and Freedom on June 19, 1968. Fifty thousand people joined the 3,000 participants living at Resurrection City to rally around the demands of the Poor People’s Campaign on Solidarity Day. 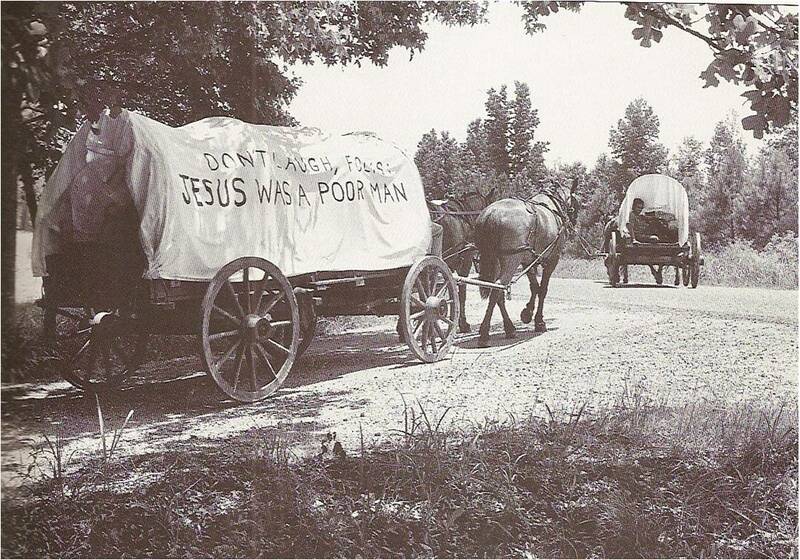 This was the first and only massive mobilization to take place during the Poor People’s Campaign. You know, whenever Pharaoh wanted to prolong the period of slavery in Egypt, he had a favorite, favorite formula for doing it. What was that? He kept the slaves fighting among themselves. But whenever the slaves get together, something happens in Pharaoh’s court, and he cannot hold the slaves in slavery. When the slaves get together, that’s the beginning of getting out of slavery. Something is happening in our world. The masses of people are rising up. And wherever they are assembled today, whether they are in Johannesburg, South Africa; Nairobi, Kenya; Accra, Ghana; New York City; Atlanta, Georgia; Jackson, Mississippi; or Memphis, Tennessee — the cry is always the same: “We want to be free.”… Now, what does all of this mean in this great period of history? It means that we’ve got to stay together. We’ve got to stay together and maintain unity.